"You have only one hour left. How will you spend it?" Military hero Colonel Sergei Petrovich Kotov (Nikita Mikhalkov) has taken temporary leave of his position and is spending a relaxing vacation with his wife Marusia's family in the country. Rowing down a scenic river with his charming young daughter Nadya (Nadezdha Mikhalkova), he seems at complete peace with his life. Everything feels idyllic away from the cities, but the rule of Stalin in 1936 was fraught with paranoia and unfair practices. Considering his celebrated status with the government, Kotov could not imagine being considered a traitor to his country. Even as they glide down the river, however, the secret police is mobilizing to destroy the popular figure. 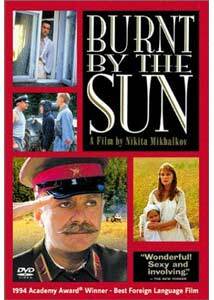 Burnt By the Sun received the Oscar� for Best Foreign Language Film in 1995 and is dedicated to "those who were burnt by the sun of revolution." Renowned director Nikita Mikhalkov filmed, starred, and co-wrote this emotional tale, which depicts the cruel removal of a happy, patriotic man. The shooting style is very straightforward, but odd supernatural moments exist that seem out of place in this historical tale. A bright yellow sphere resembling a sun appears several times, and a large balloon towing a Stalin banner provides the obvious symbolism. These items may have felt original when initially created, but on the screen they distract from the central human story. The film begins in promising fashion, with Kotov halting the movement of Russian tanks across the farmers' wheat crops. These moments inject just the right amount of whimsy and fun while presenting his powerful nature. Life becomes more complicated with the mysterious arrival of Mitya (Oleg Menshikov)�Marusia's lost love�for unexplained reasons. She is torn between her devotion to Kotov and lingering feels for the younger, handsome Mitya. Unfortunately, the pace drags considerably during this middle hour and takes far too long to get moving again. By the time his motives become clear, my overall interest had diminished to a much lesser degree. Several engaging scenes do occur, including the arrival of citizens extremely concerned with a gas attack, but nothing offers any remarkable material. Burnt By the Sun saves itself with a poignant, sad finale that is expected but still very difficult to take. Mikhalkov spends the first 90 minutes drawing us to Kotov's humanity and love for his family. While this connection should not take this long, it still creates a purposely frustrating tension during the last act. Especially touching is the tender relationship between the real-life father and daughter. The six-year-old Nadya virtually becomes the story's most interesting character by showcasing her father's strong personality. Mitya is obviously not telling us everything, and his true motives are never entirely clear by the film's end. Dragging substantially for far too long, this picture is not easy viewing for most audiences. Mikhalkov's purpose is laudatory, but the execution could have been improved significantly. Image Transfer Review: Burnt by the Sun features an uninspiring 1.62:1 widescreen transfer that does little to enhance the picturesque outdoor settings. A surprising amount of defects and grain exist on the transfer, which lessens the overall impact. In addition, the transfer is nonanamorphic, which is becoming more of a rarity among current releases. While the limited audience of this type of picture is understandable, the quality level is still disappointing. Audio Transfer Review: This disc offers a 2.0-channel Dolby Surround track that does represent a slight improvement over the mediocre visual transfer. The Russian dialogue is relatively clear, and the music does evoke a decent amount of power. However, the overall complexity is limited by the technology, and the sounds are very centralized. Everything works acceptably, but nothing rises above the basic expectations. Extras Review: The lone extra features provided are 28 chapter cues and trailers for Character, Divided We Fall, and East/West. These previews are presented in a mediocre full-screen format with stereo audio transfers. The Academy's choice of Burnt By the Sun as Best Foreign Language Film should not be a shock considering their usual method for giving awards. This picture was created for a positive purpose and delivers a convincing message about a misguided government. Unfortunately, it suffers from an extended running time and unnecessary scenes that detach us from the emotional impact. The film still delivers its message, but could have been tighter and much more insightful.